I was having a chat with a friend recently about the blog post I published on January 1, the traditional day for writing down on a napkin your resolutions for the coming year. He was saying that it didn’t sound like a bunch of resolutions of the form “I will do this new thing” or “I will change this existing behavior”. It read as more wishy-washy than that. It reminded me of something Donna has been saying since the New Year. For the past 6 months or more, she’s been in training to improve her marathon times. To aid in this, she has a personal trainer at the local megaplex gym and goes there twice a week for some kind of torturous exercise. She mentioned that around the New Year the parking lot at the gym was overflowing at the times she went, compared with before Christmas. She had to park further away from the main entrance. However, this week the parking situation has ameliorated and has regained its previous occupancy level. In other words, all those “I gotta get more exercise and lose weight NOW” resolutions have already fallen by the wayside. Why should this be? If I put my Project Manager hat on, I think it’s because too many New Year resolutions are of the Waterfall type. They’re big. It’s all or nothing. This major change has to happen, and once that’s done I’ll embark on this other major change. Just like in software development, it’s all very well making the big plans down to the last detail (“do this, do that, then do the other”) but they tend to fail more often that you’d like. There has to be more feedback in the loop. Goals have to be more bite-sized, not gulp-sized. Resiliency is the name of the game: unforeseen situations come up that have to be accommodated, be absorbed into the plan. The timetables for goals have to be measured in days, not months, to force them to be automatically smaller and more achievable. 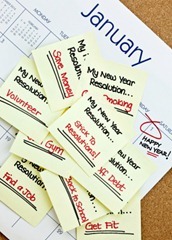 Resolutions have to be Agile, in other words. And that’s the point of my post and what my friend was remarking on: I am going to make gradual changes to help me reach my far future goals. I am being Agile. For example, with regard to this blog, my ultimate goal is to train myself to write better, to write quicker, to acquire a better facility with the language. Talk about a Waterfall process. Bloody impossible to achieve, that’s what it is. So, I’ve broken it down, made it more Agile. I have a mini-goal of one post a day. Say an hour’s work; 500 words. I have a list of topics on a pad to my left – if you’re a developer, you’d call them stories and probably write them down on post-its and put them on a whiteboard. Some of these stories are small, some wacky, some easy, some hard, some will require research and will take longer. I don’t care. Just so long as I can respond rapidly to what fate tosses in my path day by day. But, if something transpires (or conspires!) such that I don’t write a blog post one day, it’s fine. It could be that I write two the next (but still dole them out at the rate of one per day) – this has happened tonight and several times over the past month. So long as I do at least 5 per week, I feel that I’m doing well and am on track for my major goal. Ditto for the rest of my goals for the year. They’re all in train, one small step at a time. Agile resolutions, each resolutely agile. This is what I am trying this year. I usually don't do resolutions because I don't really believe in them, but this year I was in the right "zone" somehow. Having spent Christmas and New Year in Edinburgh I felt it really was time for a change. I didn't resolve to anything in particular, it was more along the line "Get up and do more stuff", which you could say is a bit unspecific, but since I didn't have anything particular in mind, it felt good enough for me. It's the end of January now and I'm pretty happy so far. I've taken up guitar lessons, am waiting to hear back for a tap dance class, written a lot more on my blog and generally spent more time actually "doing" stuff. I guess the lesson is to find goals that really match what you're aiming for. And, more than that, I resolved to not do anything that didn't seem like fun. So no gym membership for me, I'd rather try some tap dancing. Anne: excellent idea in choosing tap dance over gym membership. With tap, you get the same exercise but you don't notice since you're having such a great time just learning. That's kind of meta-agile: you complete your original goals doing something else.